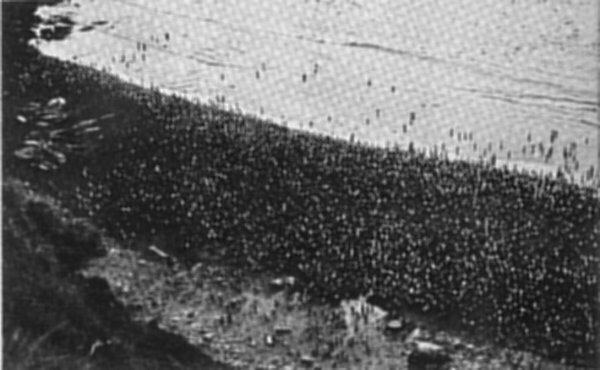 Looking down from the cliff top upon Marion's only good landing beach, with its thousands of penguins sporting on the sand and in the water of Ship Cove. SO CHANGEABLE is the weather in these latitudes that the gale that had been blowing when we turned in that Sunday night had quite blown itself out by thc following morning, and we woke to find our ship going into the anchorage at Marion in perfect weather. Landing conditions were ideal, and the Gamtoos was already at work. Working hours had presented somewhat of a problem down here since the Natal's arrival. The first shore party had for their own convenience advanced island time by two hours. When the Natal arrived she was still observing South African time - two hours ahead of Greenwich time. Confusion between ship and shore inevitably resulted. Dymond decided that ship routine with its watch system did not allow a two-hour advance in one step to be made without completely disorganising routine. He therefore compromised with a one-hour advance. When the Gamtoos arrived she, too, was observing South African time. She was unaware of the new time Systems being observed by the others. It was mutually arranged between her and the shore party that landing operations would begin on the first morning at six. There was more than an hour to go when impatient signals from the island asked when the first load might be expected. The surprised Officer-of-the-Watch replied that everybody was still asleep. An even more surprised island referred the Gamtoos to their arrangement to start work at 6 a.m. The interchange of messages that followed tended to reflect increasing excitability until they realised ashore that no one had thought of telling the Gamtoos that Marion had its own local time. Explanations followed, and the misunderstanding was immediately cleared up. For the same reason that motivated Dymond, Finlayson decided not to advance his ship's time, at least for the present. The result was that when the watches of the shore party indicated that it was six o'clock, those on the Natal showed five o'clock and those on the Gamtoos four o'clock. To complicate matters still further the ship's chronometers, which were adjusted to Greenwich time showed two o'clock. The frigate, as the clearing-house for all radio messages between the expeditions and the Union, had to translate all times mentioned in outgoing messages into Greenwich time, and in doing so her operators had to be careful to take into account the "local time" being observed at the actual place of origin of the message. It was necessary for both ships and the shore party to ration food, and none could offer very great variety. One morning I found Sara and Dike looking pleased with themselves, and I discovered that they had made a round of "courtesy calls." Starting from the island, they went first to the Natal and then to the Gamtoos. Careful timing had ensured that they would arrive at each just in time to be invited to join in breakfast, and they had a full hour in which to do justice to their host's fare before they had to excuse themselves in order to catch up on another hour - and another breakfast! After a few days Finlayson found that it was impossible to avoid confusion while three different time systems were being observed among what was really one community, and he simplified the problem as far as he was able by advancing the Gamtoos's time one hour to that of the Natal. little more than would suffice to get him home. The extra 100 tons that he had shipped was in the bottom of the holds, beneath all the cargo. It was useless to him until all the cargo had been discharged, or at least enough taken out to allow space for some of the remainder to be shifted so that the coal could be reached. The frequency of bad weather, however, was having the twofold effect of slowing down the discharge of his cargo and preventing him from benefiting from his extra coal, which he had brought with him specially to enable him to prolong his stay if the discharge of cargo should take longer than had been expected. Almost every few hours now Finlayson and "Sandy" Brodie, his Chief Engineer, were conferring on the coal position. Jack Powell, the Mate, in agreement with Dike, was giving priority to the discharge of the bulky hutment sections. This was not only in accordance with Dike's plans to start erecting the huts as quickly as possible but it also left more elbow-room in the hold. While Powell was working down as fast as he could towards the precious coal, Finlayson and Brodie pored over coal consumption figures and carefully worked out how much longer they dared stay, assuming that it was impossible to reach the extra coal. By that morning, after the hurricane, the coal safety margin had been reduced to less than 48 hours. I spent the day ashore with Sara photographing the camp and nearby bird and animal life. We had been warned not to proceed far from the camp site, as Dymond was standing by to hold the flag-raising ceremony as soon as an opportunity presented itself. He was anxious to give everybody on the island and as many as possible from the ships the opportunity of attending this important ceremony. flagstaff had been. This hole, which was quite wide and deep, had by now filled with water. Dike and his men had to drive down 18 feet before their pole struck rock. When it at last touched bottom one of the men, sighing with relief, stepped back and vanished with a splash down the abandoned hole. By the time his comrades pulled him out his teeth were chattering. Although the ceremony was scheduled to last only about ten minutes, it was necessary, before the men took up their positions, to lay down wire netting on the ground where they were to stand in order to prevent their sinking through the surface while at attention. Experience had shown that one could not stand for long on the island's surface without danger of this happening. Another peculiarity of the ground was its non-resistance to shock. If one stamped one's foot the whole surface within a radius of about ten feet would shake. Dymond's opportunity to slip his men ashore came late in the afternoon, and at 5 p.m., as soon as all the men who were taking part, numbering about 60, had assembled, the flag-raising ceremony was held. It differed from that on Prince Edward in the larger number present (formed up in a hollow square around the flagstaff, with the Natal's guard, the Transvaal's occupation party, the Army personnel and the civilians each making one side) and in the firing of a 4-inch salute by the frigate as the flag rose to the masthead. Dymond again read the Union Government's Proclamation, and thus Marion, like Prince Edward, became legally a South African colony. direct to the S.A.A.F. station at Waterkloof, near Pretoria. All the next day the Gamtoos continued sending cargo ashore as fast as her boats and the beach party could handle it. At the same time her crew managed to bring up some of the coal from the lower holds and to tip it into the bunker space. We spent most of the day dragging for our lost anchor. This necessitated our manoeuvring closer to the kelp barrier than prudence would have dictated in other circumstances. Instead, in trying to recover the anchor we got ourselves into further difficulties. Our intakes sucked up large quantities of seaweed, and before long the engine-room reported trouble developing down below. The condensers and cooling Systems of both engines were no longer functioning properly. The engines would have to be stopped and opened up for examination and cleaning. Dymond decided at once to withdraw from this danger area, but before he could pull out signs were reported of another gale in the offing. Dymond dare not risk being caught with his semi-disabled ship so close to the shore, and he had no alternative but to force his choking engines and run for the safety of the open sea. The Gamtoos followed soon after. All that night and the next day we rode through the gale on one engine only. Sharpe and his staff worked almost non-stop opening up and removing kelp from the condenser and cooling system of first one engine and then the other. They took out many bucketfuls of the weed. But for the fact that the frigate's intake system was protected with special weed traps, far more would have been sucked up. Had the Gamtoos or any other ship not so fitted got among that kelp, she would almost certainly have quickly choked her intakes and been completely disabled. completion of the annexation ceremonies, was being flashed to the Union. Early in the afternoon the engine-room reported that both engines were now functioning again. Radio contact had meanwhile been made with the Good Hope, (Commander H. E. Fougstedt) the frigate that was coming to relieve us, and we arranged to meet her to the north-west of the islands and to show her the way to the anchorage. We sighted our sister ship as dusk was gathering.